SUNY New Paltz President Donald P. Christian has signed onto a “Letter from Higher Education Leaders on Climate Action,” organized by a diverse group of higher education institutions and the Boston-based nonprofit Second Nature. 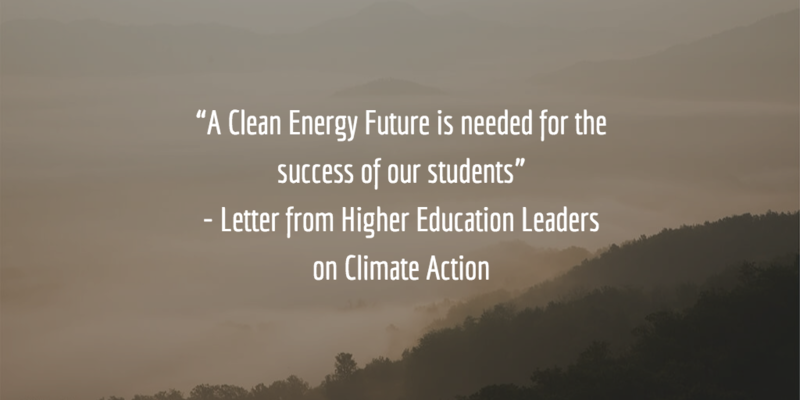 The letter, endorsed by more than 180 higher education leaders and institutions, calls on the incoming U.S. presidential administration and congressional class to accelerate progress towards a clean energy future. Specifically, it advocates continued participation in the Paris Agreement, investment in low carbon infrastructure projects, and use of peer-reviewed climate research in the creation of national climate, energy and security policy. The letter is in alignment with the goals and practices outlined in SUNY New Paltz’s Campus Sustainability Plan. The full text of the “Letter from Higher Education Leaders on Climate Action,” and the list of signatories, is available on Second Nature’s website.